One of the most popular features I built for the Hope 103.2 website way back in 2013 is the Song Finder – a web page which shows you every song played on a radio station, and a way to switch between days/hours. Listeners love it, and it saves the reception team countless calls asking ‘what song was this?’ Even now – six years later – I’m surprised at how many radio stations still don’t have this cool feature. This track history functionality was already available in the MetaRadio WordPress plugin, but now it’s also available as a HTML Template for stations without WordPress. This means you can upload a Song Finder from MetaRadio to any site with only a FTP server – you don’t need a database, or any custom coding. We provide everything you need to get this up and running, including easy integration for fifteen different radio automation systems. Of course, if you have a WordPress site than I totally recommend using the provided WordPress plugin. But this new option is great for any station not running WordPress. Download and Install MetaRadio. You can get a 30-day free trial, which will allow you to test this on your website before purchasing it. Create an empty folder on your hard drive. This will contain a local copy of your song history files. Copy the full path of this folder to the field ‘Output Folder Path’. At this point, every time a song is played on-air, MetaRadio creates or updates a JSON file in your song history folder, and also uploads it to your FTP server. There is one file per day, plus an index file. 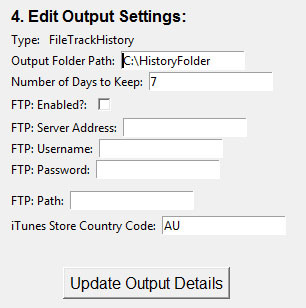 Upload this HTML file to the same folder as your song history files. You might like to embed this Song Finder as an iFrame on your website, or even integrate it into your website’s existing template.